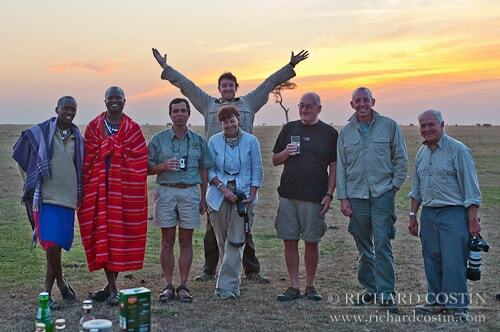 Due to fantastic demand we have put on a second Big Cat Safari trip for 2012! THIS TRIP IS NOW FULL – CLICK FOR DETAILS OF OUR 2013 WORKSHOPS INCLUDING OUR NEW MIGRATION SAFARI! PLEASE SIGN UP TO THE NEWSLETTER (Form to the right >>>) FOR DETAILS ON 2013! CAMP: Kicheche Bush Camp, same great service and accommodation with a slightly different location. We will however be relocating my hand picked (amazing) guides for this trip. This trip will be limited to 4 people! * Airline prices are currently fluctuating daily so this cost is based on the current rate which is pretty good at the moment! If you are interested in joining us it is likely to be cheaper to let us know earlier rather than later! Our fantastic group from last year with the me as the human windmill behind! Register your interest with this tour at no obligation. Your details will never be shared.